FC Barcelona secured progress to the next round by demolishing Hercules at home 7-0 with Arda Turan securing another hat-trick. With this Barca move to next round with an aggregate score of 8-1. Remember the Afghan kid who became a internet sensation when his picture wearing a Plastic bag with Messi's name on it went viral; he met his idol Lionel Messi yesterday at the friendly between Al-Ahli and FC Barcelona in Doha. Barca could only secure a tame draw against Hercules in the first leg of Copa Del Rey Round of 32 match. 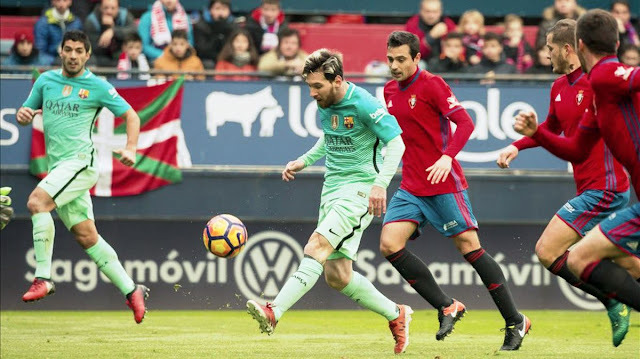 Two Goals from Lionel Messi and One from Luis Saurez helped Barca secure a much needed victory at the Estadio El Sadar Stadium against the home side Osasuna. This will reduce the lead at top to three points temporarily but it will most probably restored to six points by the time Real Madrid's home match against Deportivo at home ends. FC Barcelona completed a spectacular 4-0 victory against Borussia Monchengladbach in their final group stage match of UEFA Champions League. Messi continued his goal scoring record scoring his tenth in group stage. Arda Turan scored a hat-trick and assisted the Messi goal. Extended highlights of the first Clasico encounter between FC Barcelona and Real Madrid at teh Camp Nou on 3rd December 2016. Luis Saurez opened the scoring for Barcelona early in first half; Serio Ramos equalised at the very end breaking the majority of home fans heart. Recently El Clasico's never failed to entertain and without much doubt has been one of the most entertaining encounters between top sides in Europe. Usually when two top sides clash in any league in Europe, it usually would be a very cagey match with very much less excitement and too much intensity. But Clasico's usually is quite different in terms footballing skills and entertainment. Last night encounter was a disgrace to that tradition. It resembled the usual ManU vs Chelsea matches we have seen over the years rather that the Barca vs Madrid match. I have never seen a Clasico match filled with so much mistakes; mistakes from both sides. In the end no one emerged victorious but - Real Madrid have emerged victorious with a last minute equalizer when we take the whole picture who retained their six point lead on top of the league. Barcelona is in a middle of a season defining crisis; may be I am exaggerating a bit. But for all those Barca fans who have seen their team play in recent weeks there may be no exaggeration. For a normal top club in Europe a couple of draw shall not ring any alarm bells; but we being Barca fans are used to be worrying at the first sign of distress; so when we see what we have seen at Anoeta last week - many of us would have already broken the bell. So come Saturday, when the biggest footballing clash in universe takes place; there are enough worries to get us extremely nervous. FC Barcelona has now drawn three out of their last four games and that usually doesn't happen. May be the circumstances of each of those draws were different but the worrying part is the unwanted streak which we have picked up.